If you want to contact YLW please fill out the form below. The checkbox test is there to prevent automated sending of e-mails (I'm not sure why would someone do that but apparently it does happen). Just check each one of the four boxes and after that click "SendMail" button. If this seems to be too complicated then you can send an the old fashioned way. We apologize in advance if we are not able to respond to your e-mail in a timely fashion, that is due to the chronic lack of free time. Thank you for your e-mail and thank you for understanding. This is one of the Beijing mailboxes. 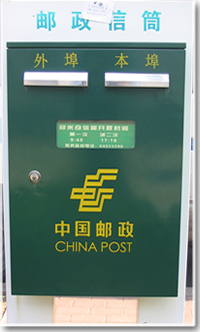 The left compartment is for mail going out of Beijing, the right one is for the mail within Beijing.